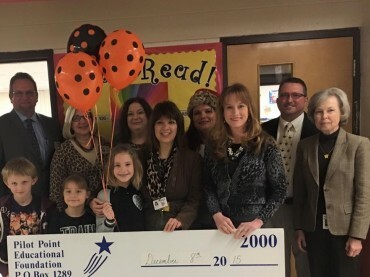 Every year the Pilot Point Educational Foundation gives PPISD Teachers a chance to apply for grants to purchase items for their classroom. Members of the board visit each campus to award the grants to the winners in a surprise ceremony. Jessica Carlile- iPad2- Do You? Angie Jurecka -LCD Projector for Library. Sheva McDonald-Tech it and Read. Tammy Oveross, Where in the World is Flat Stanley?